This is a scalable context timeline. It contains events related to the event April 24-25, 2002: Saudi Prince Said to Meet Suspected Hijacker Associate while Visiting Bush; Three Figures in Saudi Crown Prince’s Entourage Are Wanted by FBI. You can narrow or broaden the context of this timeline by adjusting the zoom level. The lower the scale, the more relevant the items on average will be, while the higher the scale, the less relevant the items, on average, will be. Alhazmi Warns Friend Al-Bayoumi Is a Spy - An FBI report from shortly after 9/11 obtained by the website Intelwire.com will similarly mention, “Alhazmi disclosed to _____ [that al-Bayoumi] was a spy for the Saudi government and directed ______ not to socialize too much with him.” (Several names mentioned are redacted, and al-Bayoumi’s name is inferred from other references to him.) [Federal Bureau of Investigation, 4/15/2002 ] It is unclear what the source for this information is, or when exactly Alhazmi may say this. Others Concur Al-Bayoumi Was a Spy - Many US investigators will later conclude that al-Bayoumi is in fact a Saudi spy (see August 1-3, 2003 and September 7, 2004). Furthermore, some FBI officials will allegedly conclude that Alhazmi and Almihdhar also are connected to Saudi intelligence (see 2006 and After and August 6, 2003). Newly hired Defense Department public relations chief Victoria Clarke (see May 2001) begins a series of regular meetings with a number of Washington’s top private PR specialists and lobbyists. The group is tasked with developing a marketing plan for the upcoming war in Iraq. It is remarkably successful in securing press cooperation to spread its message (see August 13, 2003 and After May 31, 2001). Bipartisan Makeup - Reporter Jeffrey St. Clair will later write, “The group was filled with heavy-hitters and was strikingly bipartisan in composition.” The group, later informally dubbed “the Rumsfeld Group,” is made up of, among others, PR executives John Rendon and Sheila Tate, Republican political consultant Rich Galen, and Democratic operative Tommy Boggs (brother of NPR’s Cokie Roberts and a PR consultant for the Saudi royal family; St. Clair believes Boggs may have had a hand in the decision to redact 20+ pages concerning the Saudis from Congress’s report on the intelligence failures leading to the 9/11 attacks—see April 2003 and August 1-3, 2003). The direct involvement, if any, of Defense Secretary Donald Rumsfeld is unclear. From left to right: Senator Bob Graham (D), Senator Jon Kyl (R), and Representative Porter Goss (R). [Source: US Senate, National Park Service, US House of Representatives]Around 8:00 a.m., on September 11, 2001, ISI Director Lt. Gen. Mahmood Ahmed is at a breakfast meeting at the Capitol with the chairmen of the House and Senate Intelligence Committees, Senator Bob Graham (D-FL) and Representative Porter Goss (R-FL), a 10-year veteran of the CIA’s clandestine operations wing. Also present at the meeting are Senator Jon Kyl (R-AZ) and the Pakistani ambassador to the US, Maleeha Lodhi, as well as other officials and aides. (Goss, Kyl, and Graham had just met with Pakistani President Pervez Mushrraf in Pakistan two weeks earlier (see August 28-30, 2001)). [Salon, 9/14/2001; Washington Post, 5/18/2002] Graham and Goss will later co-head the joint House-Senate investigation into the 9/11 attacks, which will focus on Saudi government involvement in the 9/11 attacks, but will say almost nothing about possible Pakistani government connections to al-Qaeda and the 9/11 attacks (see August 1-3, 2003 and December 11, 2002). [Washington Post, 7/11/2002] Note that Senator Graham should have been aware of a report made to his staff the previous month (see Early August 2001) that one of Mahmood’s subordinates had told a US undercover agent that the WTC would be destroyed. Some evidence suggests that Mahmood ordered that $100,000 be sent to hijacker Mohamed Atta (see October 7, 2001). 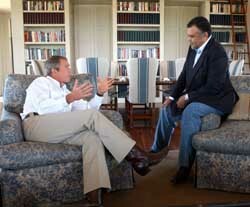 Prince Bandar and President Bush meet at Bush’s ranch in August, 2002. [Source: Associated Press]Crown Prince Abdullah, the de facto ruler of Saudi Arabia, is due to arrive in Houston, Texas, to meet with President Bush at his ranch in nearby Crawford, Texas. Abdullah’s entourage is so large that it fills eight airplanes. As these planes land, US intelligence learns that one person on the flight manifests is wanted by US law enforcement, and two more are on a terrorist watch list. An informed source will later claim that the FBI is ready to “storm the plane and pull those guys off.” However, the State Department fears an international incident. An interagency conflict erupts over what to do. The Wall Street Journal will report in 2003, “Details about what happened to the three men in the end are not entirely clear, and no one at [the State Department] was willing to provide any facts about the incident. What is clear, though, is that the three didn’t get anywhere near Crawford, but were also spared the ‘embarrassment’ of arrest. And the House of Saud was spared an ‘international incident.’” [Wall Street Journal, 10/13/2003] The next day, Osama Basnan, an alleged associate of 9/11 hijackers Nawaf Alhazmi and Khalid Almihdhar, reports his passport stolen to Houston police. [Newsweek, 11/24/2002] This confirms that Basnan is in Houston on the same day that Crown Prince Abdullah, Prince Saud al-Faisal, and Saudi US Ambassador Prince Bandar meet with President Bush, Vice President Cheney, Secretary of State Powell, and National Security Adviser Rice at Bush’s Crawford ranch. [US-Saudi Arabian Business Council, 4/25/2002] While in Texas, it is believed that Basnan “met with a high Saudi prince who has responsibilities for intelligence matters and is known to bring suitcases full of cash into the United States.” [Newsweek, 11/24/2002; Guardian, 11/25/2002] The still-classified section of the 9/11 Congressional Inquiry is said to discuss the possibility of Basnan meeting this figure at this time. [Associated Press, 8/2/2003] It is unknown if Basnan and/or the Saudi prince he allegedly meets have any connection to the three figures wanted by the FBI, or even if one or both of them could have been among the wanted figures. Basnan will be arrested in the US for visa fraud in August 2002, and then deported two months later (see August 22-November 2002). According to Sen. Bob Graham (D-FL), the 9/11 Congressional Inquiry he co-chairs later will uncover a CIA memo written on this date. The author of the memo writes about hijackers Khalid Almihdhar and Nawaf Alhazmi and concludes that there is “incontrovertible evidence that there is support for these terrorists within the Saudi government.” [Graham and Nussbaum, 2004, pp. 169] Apparently, this memo will be discussed in the completely censored section of the Inquiry’s final report that deals with foreign government involvement in the 9/11 plot (see August 1-3, 2003). Osama Basnan, one of the key players in a suspected transfer of funds from the Saudi government to these two hijackers, is arrested in the US a few weeks after this memo is written, but he will be deported two months after that (see August 22-November 2002). Anwar al-Awlaki, the imam for three of the 9/11 hijackers in the US, lives openly in Britain. Growing Suspicions about Al-Awlaki in US - After 9/11, US investigators increasingly suspect that al-Awlaki’s links with hijackers Nawaf Alhazmi, Khalid Almihdhar, and Hani Hanjour in the US were more than just a coincidence. In October 2002, al-Awlaki is briefly detained while visiting the US but is not arrested, even though there is an outstanding warrant for his arrest (see October 2002). The FBI as a whole does not believe he was involved in the 9/11 plot. However, some disagree. One detective tells the 9/11 Commission in 2003 or 2004 that al-Awlaki “was at the center of the 9/11 story.” The 9/11 Congressional Inquiry releases its final report in 2003, and it states that al-Awlaki “was a central figure in a support network that aided [Alhazmi and Almihdhar]” (see August 1-3, 2003). 9/11 Commission Executive Director Philip Zelikow prevents two investigators, Mike Jacobson and Dana Leseman, from viewing a key document they need for their work. Jacobson and Leseman are working on the ‘Saudi Connection’ section of the commission’s investigation, researching leads that there may have been a link between two of the 9/11 hijackers, Khalid Almihdhar and Nawaf Alhazmi, and elements of the government of Saudi Arabia. Zelikow is also involved in another, related dispute with Leseman at this time (see April 2003). 28 Pages - The classified document in question is part of the 9/11 Congressional Inquiry, 28 pages that were redacted in the final report and concerned possible Saudi government support for two of the 9/11 hijackers (see August 1-3, 2003). The 28 pages were actually written by Jacobson and are obviously relevant to his and Leseman’s work at the 9/11 Commission, but Jacobson cannot remember every detail of what he wrote. Leseman Later Fired - Leseman later obtains the document through a channel other than Zelikow, and will be fired for this (see (April 2003)). 9/11 Commission Executive Director Philip Zelikow fires one of the commission’s investigators, Dana Leseman, with whom he has had a number of conflicts (see April 2003). Leseman and a colleague were researching a possible link between two of the 9/11 hijackers, Khalid Almihdhar and Nawaf Alhazmi, and elements of the government of Saudi Arabia. Blocked - The firing stems from a dispute over the handling of classified information. Leseman asked Zelikow to provide her with a document she needed for her work, 28 redacted pages from the 9/11 Congressional Inquiry report she had helped research herself, but Zelikow had failed to do so for some time (see April 2003 and August 1-3, 2003). Leseman then obtained a copy of the report through a channel other than Zelikow, which is a breach of the commission’s rules on handling classified information. Some colleagues will later say that this is just a minor infraction of the rules, as the document is relevant to Leseman’s work, she has the security clearance to see it, and she keeps it in a safe in the commission’s offices. However, she does not actually have authorisation to have the document at this point. 'Zero-Tolerance Policy' - Zelikow will later say she violated the commission’s “zero-tolerance policy on the handling of classified information,” and that she “committed a set of very serious violations in the handling of the most highly classified information.” Zelikow is supported by the commission’s lawyer Daniel Marcus, as they are both worried that a scandal about the mishandling of classified information could seriously damage the commission’s ability to obtain more classified information, and will be used as a stick to beat the commission by its opponents. 'Do Not Cross Me' - Shenon will add: “To Leseman’s friends, it seemed that Zelikow had accomplished all of his goals with her departure. He had gotten rid of the one staff member who had emerged early on as his nemesis; he had managed to eject her without attracting the attention of the press corps or the White House. And he had found a way to send a message to the staff: ‘Do not cross me’.” [Shenon, 2008, pp. 110-113] Zelikow will later be investigated for mishandling classified information himself, but will apparently be exonerated (see Summer 2004).